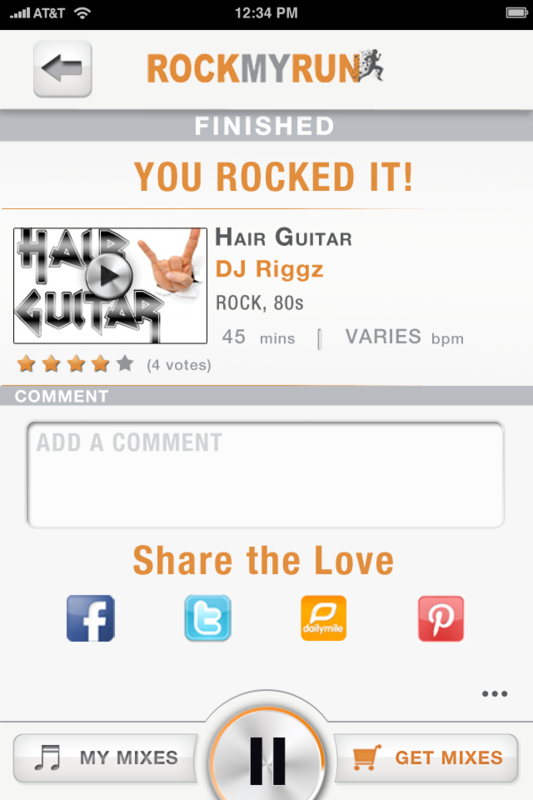 Over the past few months we have been hard at work on our first of many mobile apps for Rock My Run. Although it feels like we have been working on it FOREVER, we are pretty pumped – the app will be seriously sweet when it’s finished! It has a fully custom interface, can be used on both the iPhone AND iPod touch, and will make it much, much easier to get kick a** running music on these devices. About a week and a half ago we put out a shout for a few beta participants and quickly filled up the available spots we had. The participants should be getting their builds within the next few days for a hands on trial. For those that didn’t get a chance to get into the beta, or are just plain eager to see what this app will look like, here are a few screen shots with explanations that should give you a feel for how the app will work. Enjoy! 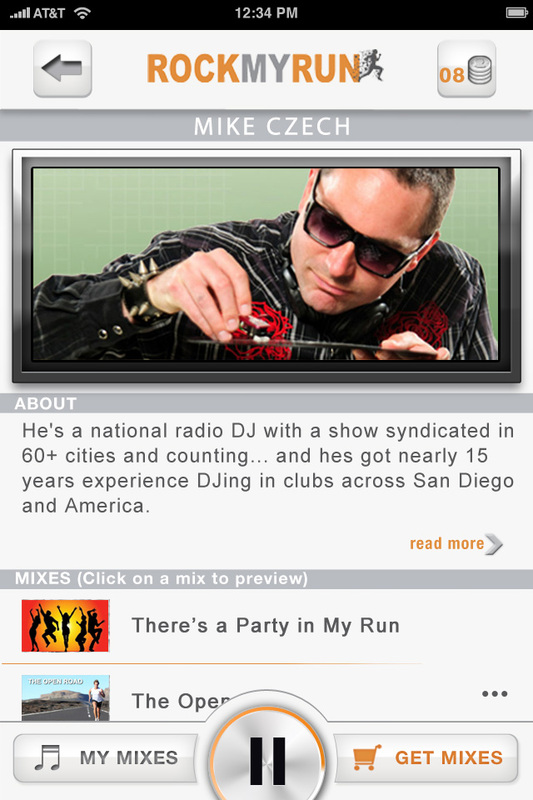 If you’re an existing Run Rocker, when you first fire up the app and login, you will see all the mixes you have access to under the “My Mixes” screen. Each mix has the full details about it, including description, length, BPM, ratings, votes and track listing.No more going for a run with a mix and wondering what tracks are in the mix! 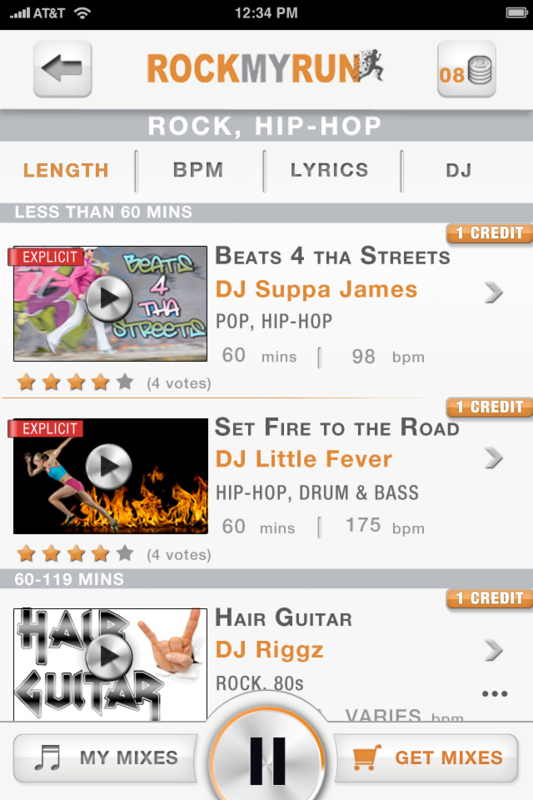 Browse for new mixes right on your device with all the cool mix filters you need to find the right mix for your runs. Once you’ve rocked your run, hit the finish button and share your success with your peeps via Facebook, Twitter and Pinterest.Any tips with this particular mix? Leave a comment right when you finish up! There’s lots more in the app but this should give you a good idea of what we’re building. Based on these screen shots is there anything that you want to be SURE we include? What in your opinion would help make this app even more awesome? Don’t worry, Android is next on our list! We’ll bring the same sweet interface to those devices soon! When will it be available and will it be free?! Looks a great and easy way to have access to our mixes! Can’t wait! You guys have really changed my runs!! All we can say right now is “soon” 🙂 We’re working towards our beta test right now and hope to have it out in the next few weeks! 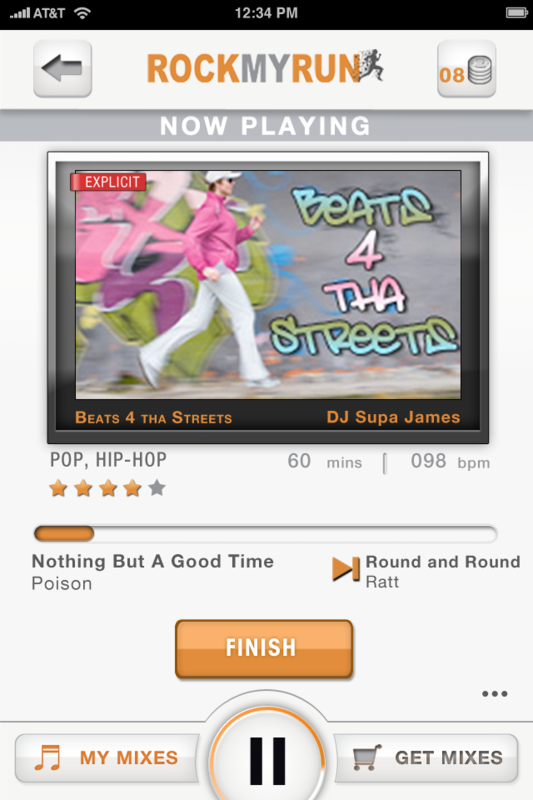 The app will definitely be free and just like the website, you’ll use credits to get mixes. Stay tuned! Just discovered this fantastic site. Any news on when the app will be available. ?Just did a search and can’t find it….